[2016-2018] I ran in to Stop & Shop (Giant) and man was I surprised at how they've stepped up their ice cream game. 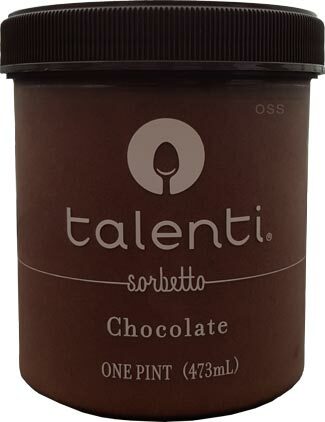 Not only is the new Talenti officially out, but they brought in several more brands like Gelato Fiasco and Blue Bunny. No more rolling my eyes every time I see GF for way too much money at Whole Foods. I saw the assortment of new 2016 products expand further but I wound up going back to the Talenti for my snack break today. When the new Talenti pints first hit the shelves a few weeks ago, this was the first pint to catch my eye. This is the first time Talenti has gone with a reverse coloring scheme (white writing on a dark product instead of their usual dark writing). It's just a slick looking product and you know that I'm all about the visuals.... though I am a little surprised I let the visuals override my picking process. To be honest, it reminds me of a tootsie roll, in a more, slightly watery foundation anyway. To keep it simple, this won't be winning any awards any time soon, it's too similar to other things I've tried. Ofcourse, saying it that way isn't proper. If you wan't an excellent chocolate sorbet, Gelato Fiasco offers several including a very dark chocolate one. Basically for me there is no wow factor, I've already been spoiled. It's nice this will be widely available, and it doesn't have much competition in the sorbet space, but it's too late for me, I've had better. I'll be honest, I'm mad at myself for not trying one of the other flavors first. If you've never had chocolate sorbetto, sure, give it a try. Junk Food Guy did and really enjoyed it. If you've had Gelato Fiasco, just skip this one for now, unless you want to save $2 a pint. On Second Scoop: Ok, I tried a trick. Since the edges and top of my pint are textured a little different then the rest of the pint (traveling? freezer burn? who knows), I just ate the center on my second scooping, and that did help me focus on what matters. I think my problem still boils down to being spoiled by what has come before. 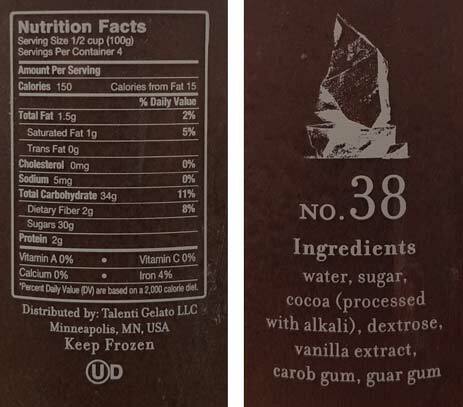 This is just regular chocolate sorbetto and doesn't have those rich dark notes that I've had in other products, not does it have an x-factor like say peppermint. I just don't think this is my thing. The product is fine, but be prepared for it to not blow your mind, that's all. On Final Scoop: I may have cheated and smashed some Oreo Thins in to my final serving, and I must say, it was the right choice. It's a shame they didn't take the cookie bits from their Caramel Cookie Crunch flavor and put them in here, now that would have been fun! There's just not much that can be done with chocolate nor vanilla at this point that would be anything short of boring. 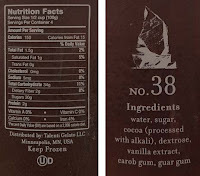 I think that the problem these days is that the quality of the ice cream is deemed less important than the add-ins like cookies, cake, cores, candy, etc so we forget how good a real pure chocolate or vanilla can be. It's too bad but I get that it's more exciting to have lots of stuff in it. I guess I am more of a traditionalist when it comes to ice cream. I still want Ben and Jerry to make a vanilla or a chocolate or a mint with the chocolate chunks and leave out the nuts and cookies! I often find myself defending the classics, thing is, this isn't ice cream, it's water based sorbetto. The base just isnt rich enough to hold my interest through four servings. Hagaan Dazs seems to be good at being creative but also more minimalist than some, and I think the quality of the base is often the result. With Ben and Jerry it seems to be the package deal, but the base isn't necessarily amazing. I thought this flavor was good considering it has a water base. It tastes like a sophisticated fudgesicle. If you want chocolate ice cream, it's not going to be the same. If you want something lighter, this could be a good option. Sorbetto isn't ice cream, right? So GF has a dark chocolate gelato, which is ice cream. Not really comparing apples to apples. @Anon: I assume you mean lighter in density as opposed to calories since it still has 150 of those per serving. If Talenti goes on sale for around $2.99 I'll buy the Vanilla Caramel Swirl, but since it's usually around $3.99-$4.99 I'll try the more interesting flavors first. Just tried it last night. Have never had a sorbetto, and since I am a chocolate freak, of course I'm going to grab this right off the bat. Price wise, H.D. and the brothers B&J are outrageous. It depends on what you want. And I did get what I wanted with this! 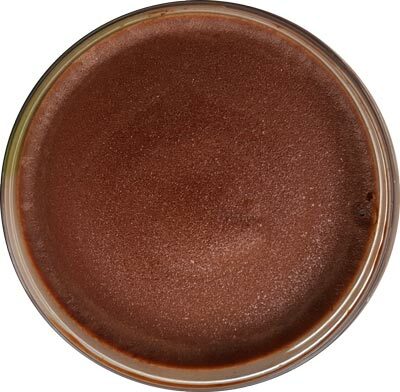 It's smooth, creamy, non-dairy, like melt-in-your-mouth dark chocolate candy, but cold. In So. Az, we like cold this time of the year! I may dress it up next time with bananas and coconut..